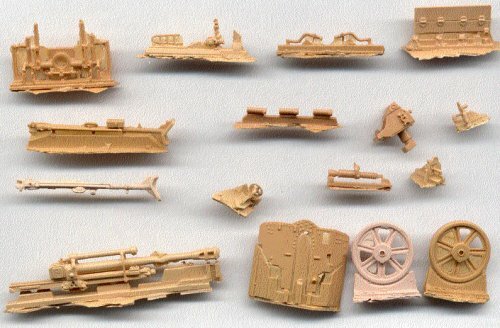 An all resin kit consisting of 21 tan parts. Good Points: Very good casting with sharp detail: and accuracy. The casting blocks and flash are easy to clean off. Much better detail than Revell's version of this weapon. The elevation and traverse handwheels are particularly done well. It's German! Price is reasonable and a very good accessory set of ammunition and boxes is also available from LEVA. Negative Points: Very delicate and may not be suitable for wargaming where it will be handled rough; though gluing it to a base would solve this. Its German (I would like to see more good Soviet, Italian and Czech artillery in small-scale also.)! The scan of the parts above shows the good rendition of the pressed steel wheels next to the very well done shield at the lower right corner. At the top left is the bottom carriage and the two trails, both common with the Pak 40 AT gun. At lower right are the two pressed steel wheels with solid rubber tires and the shield. 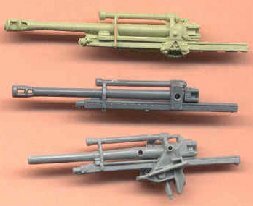 Above is a comparison photo of (from top down) LEVA's le FH 18/40 gun, the le FH 18(M) barrel from ESCI's Wespe model kit, and Revell's le FH 18 soft plastic version, all advertised as 1/72. I find the LEVA version is far more detailed and accurate than the lower two and can substitute well. The le FH 18 10.5-cm was the standard and most common field howitzer from the late 1930's till the Second World War's end. The gun replaced the earlier10.5-cm le FH 16 howitzer and the 75-mm le FK 18 guns (which actually continued to serve in training and second line units such as in Normandy, 1944). Over time it evolved as needed and proved to be reliable, though heavy for its caliber and performance. According to Engelman's Schiffer book, the Germans began WW2 with 4,862 of these howitzers, with a further 6,933 delivered by 1945 [I believe this quantity includes le FH 18(M) guns described below]. Engelman notes 24 different le FH 18 variants designed. Below is a brief list of its variations and potential conversion ideas. At the end of this article is glossary of terms and abbreviations. 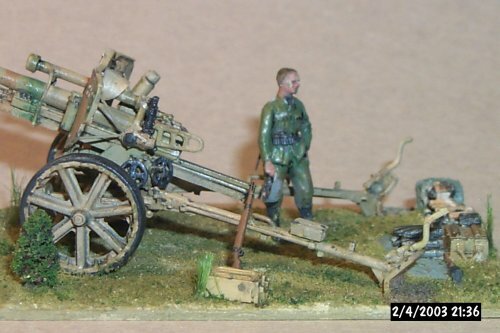 The le FH 18 is the howitzer represented by Revell's soft polyurethane set with wagon, horses and figures. The Revell kit comes with pressed steel wheels and solid rubber tires suitable for horse or vehicle towing, smaller and different wheels than LEVA's version. It was also and originally issued with wood spoke wheels, with or without solid rubber tires. [I have never seen the Revell kit type wheels used on the LEVA version of this howitzer so this conversion may not be legal.] The trail legs were box types. Remove the muzzle break and LEVA's gun can be substituted onto the Revell carriage to improve that model. 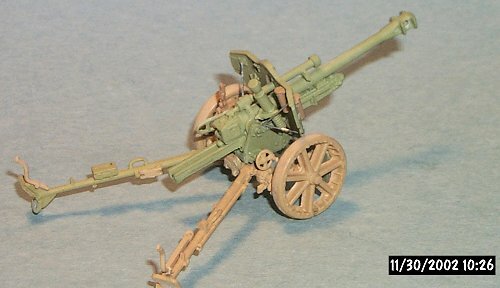 The le FH 18/40: This is the gun represented by this LEVA model. It actually is a combination of the original le FH 18, with the muzzle brake of the le FH 18(M) mounted on a modified carriage of the German Pak 40 anti tank gun and with the le FH 18 shield. This modification was an effort to make a lighter weapon and to standardize parts. It was not much lighter though and the carriage was stressed at high elevation firing. To address this extra stress, wings were added to the muzzle break to increase its efficiency. Pressed steel wheels with solid rubber tires, larger than the Pak 40 wheels, where given to raise the gun higher and therefore allow a greater elevation of the gun. Between March 1943, and April 1945, 10,245 le FH 18/40 were delivered (Engelman). The le FH 18(M): This version consisted of the regular le FH 18 howitzer and carriage with a few modifications and a muzzle break to allow a more powerful charge and therefore greater range. This version can be made by mounting LEVA's gun and cradle on Revell's carriage (and sanding off the muzzle break wings). I have seen it with either the pressed steel wheels with solid tires or with wood spoke wheels. This weapon, designated the le FH 18/2, is what was mounted in the Wespe SP howitzer [LEVA's gun can be substituted for the less detailed gun in ESCI's Wespe model.]. Also according to Engelman, 1,260 le FH 18 with a jacket cradle and muzzle brake was installed in the Sturmhaubitz III assault gun. 7M85 7.5-cm Feld Kanone: The 7M85 high velocity cannon (rather than howitzer) is not mentioned in the Schiffer book but is discussed in Ian Hogg's book (both books mentioned below). This was a German attempt to give the field gun units a better anti-tank capability and is an odd step backward in ways. The Pak 40 high-velocity anti tank gun was mounted on the carriage of the le FH 18/40 which is interesting in that the le FH 18/40 carriage is a modified Pak 40 carriage. The 7M85 cannon was produced with the le FH 18 shield, and with a greater elevation than the Pak 40. 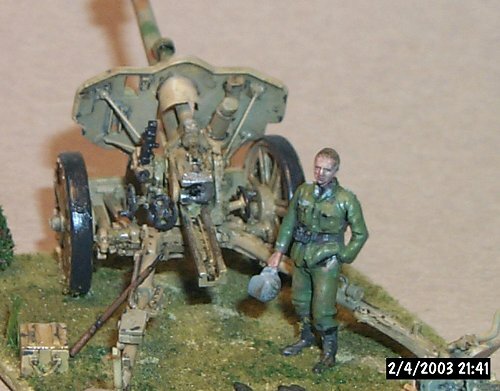 This should be an easy conversion using a Hasegawa, Al By, Modelkrak or ESCI Pak 40 gun with LEVA's shield and on LEVA's le FH 18/40 carriage and cradle. Towing vehicles for these guns were typically any of the German 3-ton trucks: (ESCI or Retromodels Opel Blitz, AlBy Ford, or TP Models' Mercedes L701 trucks, etc. ), a Maultier halftrack (AlBy-Opel Blitz Maultier or Ford Maultier. And let us not leave out the Sd. Kfz 11 3-ton tractor (ESCI), Sd.Kfz. 251 halftrack (ESCI or Hasegawa), a Styer RSO tractor (Modelkrak), or a Skoda RSO (Extratech). A note regarding gun designations. Historically Germany, France and others nations designated gun by the year released, such as the French 75-mm Model 1897 and German 77-mm FK 96 (for 1896). This has lead some to believe that guns like the leFH 18, 8.8-cm Flak 18, 15-cm sFH 18 and 10.5-cm K 18 to have been of 1918 WW1 vintage. Actually all these weapons were developed in the 1920's in secret, in violation of the 1919 Versailles Treaty. The designation 1918 was essentially a mask to hide German weapons development and re-arming prohibited by the treaty (Jager, pages 218-219). Clean-up was easy with a sharp blade and razor saw. Scoring the pour plugs with a knife or razor saw often allowed the part to be easily snapped off and then cleaned up with a sanding stick and sandpaper. Some parts are very delicate, both of the carriage's torsion bars were broken off during assembly and I recommend that you reinforce them with strips of thin styrene before gluing the wheels on. The muzzle break needs to be drilled out. The only parts I added that did not come with the kit are four copper wire shield-braces, and a small curved(bullet-splash?) shield over the gun recouperator made from aluminum sheet. Cyanoacrylate (Super) glue was used for my model though 5-minute epoxy can also be used. The solid rubber tires I believe should have three grooves (channels) that can be cut in with a fine saw blade. As the le FH 18/40 was issued in March 1943, I believe that most of them would be painted in Dunkelgelb (Panzeryellow) with or without brown and green camouflage patterns. The gun sight and solid rubber tires I painted dark gray to represent an in-scale black color. Guns did not normally come with much as far as markings go, though a letter battery designation on the shield (A, B, C, or D etc.) was not uncommon. Names of girlfriends and spouses painted onto the barrel were sometimes seen. Very well done model; competitive quality with many of the best resin model makers, and highly recommended. Very delicate though, which is often the price to pay for fine detail. In the completed model I added LEVA German 105-mm howitzer ammunition from accessory set 72-E-11. The 1/72 scale figure is from Preisser. I understand that LEVA had plans on eventually releasing all the above versions, the original le FH 18, and the le FH 18(M) howitzers; and the 7M85 Feld Kanone, as well as a caisson (for a horse drawn gun). German Light Field Artillery, 1935-1945, by Joachim Engelmann, Schiffer Publishing, (1995). An excellent and inexpensive softcover with decent photos and descriptive text. German Artillery of World War Two, by Ian V. Hogg, Greenhill Books, London; and Stackpole Books, Pennsylvania (1997). An excellent hardcover book, about the best I have seen on German artillery from AT guns, through railroad guns, recoilless and ammunition. German Artillery of World War One, Herbert Jager, Crowood Press (2001). A very good hardcover covering many of the weapons used also in WW2.